Welcome to the first recipe post over at The Therapeutic Foodie! I wanted to start off with a very simple recipe featuring the superstar of fall: pumpkin! 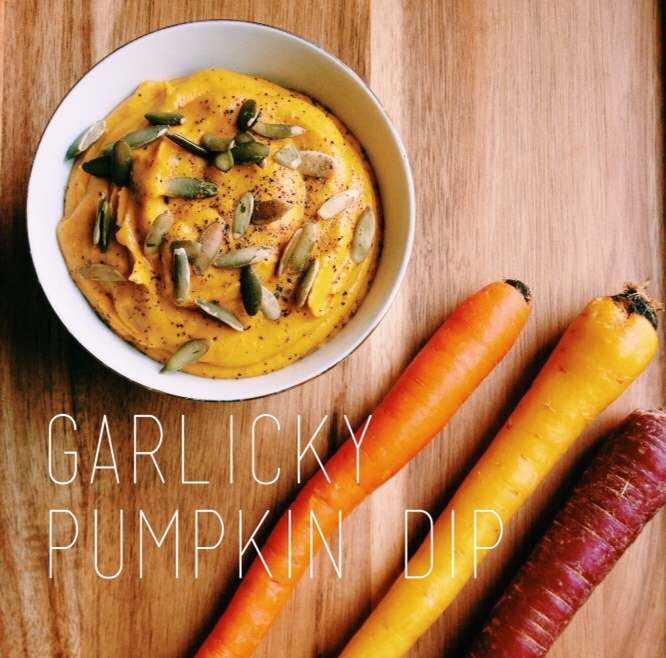 Garlicky Pumpkin Dip is easy to make and a fun way to take in all the health benefits of pumpkin. Full of fiber, beta-carotene (which converts into vitamin A in your body), and antioxidant vitamins such as vitamin C and vitamin E, you can be assured that you are nourishing your body with a nutrient-dense food! 1 15 oz. can of pumpkin (I like to use Farmer’s Market Brand Organic Pumpkin – it has a BPA free liner and is non GMO verified). Blend all ingredients until smooth and transfer to a serving bowl. Top with raw pumpkin seeds and a generous sprinkle of freshly ground pepper. Garlicky Pumpkin Dip goes great with veggies, and can make a great addition to Thanksgiving as a healthy appetizer. I like to pair it with rainbow carrots for a pretty presentation! I now have Instagram and a Facebook page for The Therapeutic Foodie – check out my page and stay tuned for more fun recipes and wellness articles. See you next week! ← Welcome to The Therapeutic Foodie!